INNER AWAKENING, Nithyananda Dhyanapeetam’s flagship yoga and meditation program, culminated in a spiritual tour to South India’s ancient temple towns of Madurai and Tiruvannamalai. The program had been personally conducted by Paramahamsa Nithyananda from 1st- 22nd July at Kodaikanal, a scenic resort tucked away in Tamil Nadu’s upper Palani hills. Notwithstanding the recent highly publicized smear campaign against Nithyananda by a sensationalist TV channel, participants from 18 countries participated in this 21-day transformational retreat, which included yoga, meditation, talks, interactive sessions and spiritual leisure activities. A number of new kriyas (dynamic techniques) for physical and mental problems, traditional heavy yoga, ayurvedic holistic cleansing methods and personal guidance from experts in natural medicine were also offered as part of this retreat. eN-Genius, a natural leadership program for children between 4-14 years, was also conducted on the same premises. The program includes brain yoga, creative art, memory camp, Vedic chanting and outdoor activities, among others. In Kodaikanal, the program culminated in a grand energy darshan (initiation) for the Inner Awakening (IA) graduates that lasted several hours. 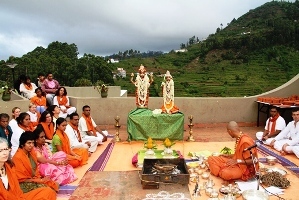 Paying his respects to eh millennia-old Vedic tradition of INdia, Paramahamsa Nithyananda had emphasized at the start of the program that none of the techniques or knowledge expressed during the program had been personally invented by him, but were drawn from the vast repository of ancient Vedic wisdom. The master’s role lies in empowering the participants to receive and hold the energy of these techniques, through the power of his initiation. In Madurai, participants visited the world-famous Meenakshi Temple, Koodal Azhagar Temple, Kallazhagar Temple, Kalabhairaveshwara (Karuppar Swami) temple and others. In Tiruvannamalai, they will visit the Arunachaleshwara Temple, pay their respects at the samadhi (final resting place) of two of Nithyananda’s gurus and spend some quiet time at Pavalakundru, the hill where Nithyananda had had his first experience of enlightenment at the age of twelve. So what are the Inner Awakening participants carrying back with them at the end of 21 days?